As interns, we have the unique opportunity to get a behind the scenes look at how our government works and the legislative process. We get to see first hand how each internal part helps further the Legislature’s ultimate goals and public policy initiatives. But with the generous support of our sponsors, we also get to see the behind the scenes of some of the top industries in Ontario. Today, our sponsor spotlight is on Rogers Communication and our visit to their Toronto studio. On our tour of Sportsnet, we visited several different sets of their regular shows including Tim and Sid, Canada’s sports duo. We all had our fun looking around the set, checking out the broadcasting equipment and taking turns playing the role of the program’s hosts. We also had the chance to walk through the bullpen where we saw all the sports journalists hard at work watching playbacks of sports games, checking player stats, and scanning social media for new material. You could definitely feel the energy in the room! Finally, we sat down with Jodi Parps the Manager of Government Relations. Her portfolio covers both provincial and municipal jurisdictions. She explained the unique features of doing GR for an international telecommunications organization like Rogers that has so many multifaceted operations including service delivery and content creation. Thank you so much to Jodi and the whole team at Rogers that took time to show us around. We loved spending our Friday afternoon with you. We really appreciate your continuous support for OLIP! Today’s sponsor spotlight is on our generous donor Estee Lauder. We sat down with the Executive Director of Global Regulatory Affairs and Government Relations, Kathleen Ljubisic and the Executive Director of Manufacturing Campbell Piper to learn about Estée Lauder Companies’ global operations. During their presentation, we were surprised to learn just how many skincare brands are represented by Estee Lauder as the parent company, such as MAC, Clinique, and Smashbox. We were also proud to learn that the items produced right here in the GTA are shipped to international markets around the world. One of the highlights of the visit was getting a behind the scenes look at the production cycle of a bottle of the iconic Ruby Woo MAC lipstick. We suited up in our safety gear (hair nets included) and walked through the lipstick’s entire lifecycle. We started at the ingredient selection and formula mixing section where just the right amount of all the secret ingredients are assembled together in massive industry mixers. During our tour, we even saw the production of a brand new MAC colour coming in their next release! Finally, we moved on to watch product moulding, bottling and packaging, before it finally gets shipped off to Estee Lauder brand stores and distributors around the world. On our way out, Estee Lauder gifted us a goodie bag of make-up and skincare treats, including our very own Ruby Woo lipstick – talk about coming full circle! Thank you so much Estee Lauder for your warm welcome, generosity and knowledge. We really appreciate your support of program! Today we are shining the spotlight on OLIP’s long time sponsor and Canadian manufacturing company, Bombardier. On December 14th 2018, we had the opportunity to visit their aerospace manufacturing facility in north Toronto. From check-in by Helen Medeiros, Event & Site Tour Coordinator, to our departure, we were greatly taken care of. Our tour guide, Pasha Pirouzi, Global Business Aircraft AMO & Deliveries lead, provided us with a historical overview of the progression of each aircraft model along with a tour of Bombardier’s central hanger to watch mechanics and engineers assemble planes from start to finish. We even got to meet the luxurious Global 7500, the newest model in the company’s fleet holding the title as the world’s largest business range jet owned by celebrities and high ranking public officials. Following our tour we had the chance to sit down with the government relations team including; Sandra Buckler, Senior Director External Affairs and Public Relations and Yana Lukasheh, Manager of Government Affairs to discuss their relationship with government and their experiences working for such a massive, Canada-centric organization. Although all industries traditionally have a government relations team who is the representative of the organization to elected officials, it is always interesting to hear about how each team develops their own communication style based on their organization’s mandate. Bombardier’s GR team was extremely generous with their time and provided high level insights into Bombardiers Inc.’s full scope of work including transportation, aviation and financial services. It is always so special for us to be hosted by fantastic sponsors, like Bombardier. It is absolutely one of the highlights of being an OLIP intern to learn on site about the diverse industries around Ontario. A special thank you goes out to Alice Trudelle, Manager of Government and Parliamentary Affairs for making our visit possible. Thank you, Bombardier for being a loyal OLIP sponsor and for taking time out of your day to educate us about your work! Just like that, our Yellowknife study tour has come and gone, and the House has been sitting for almost two weeks now. But ask any one of us, and we will tell you that our lives have been changed for the better after visiting the Northwest Territories. One week in Yellowknife was enough to make us fall in love with the city. We were welcomed to the NWT Legislature with warmth and generosity. We had a number of meetings, activities, and life changing experiences there to keep us smiling for the rest of the year. Meeting with such a diverse group of people in various roles really gave us an in-depth understanding of how government runs in the Northwest Territories. It is impossible to go to Yellowknife without hearing of their consensus form of government.In this style of government, Members are elected as independents and attempt to come to decisions that all members are comfortable with. One attribute of consensus governments is that they are free of partisan politics. Being from Ontario, it was incredible to learn the ins and outs of consensus government. We quickly learned that just because there are no formal political parties, the NWT is not free from politicking — they have a different set of unique issues that arise in their government. Experiencing consensus government in action is truly a privilege and felt like we were watching a legislature at the peak of of its democracy. In addition to meetings with officials, we were beyond excited to explore the various activities that Yellowknife has to offer. Among the Yellowknife experiences, our highlights consist of watching the Northern Lights together as a group, continuing the tradition of eating at Bullock’s Fish and Chips with the Clerk of the House, and dog sledding! I don’t think we expected to fall in love with Yellowknife and its residents quite like we did. This experience made us see the true beauty of winter, very different from our slushy experience in downtown Toronto! We saw the diversity of landscape, people, and opportunities that the Great North has, and this made us all the more grateful to be Canadian. Apparently, every year there are a few interns so enamored with the NWT that they pledge to move there. So far this hasn’t happened yet, but there are a couple in this cohort who seem keen on the idea. Let’s hope that this dream can become a reality – it would truly be such an adventure to live and work there. Again, we’re so grateful to be in OLIP and to have had the opportunity to see and experience a new part of Canada that we had only dreamt about. Special shout out to Cynthia and Haley at the legislature who scheduled our entire trip and welcome us so kindly to Yellowknife — we couldn’t have done this trip without you! The day has finally come! 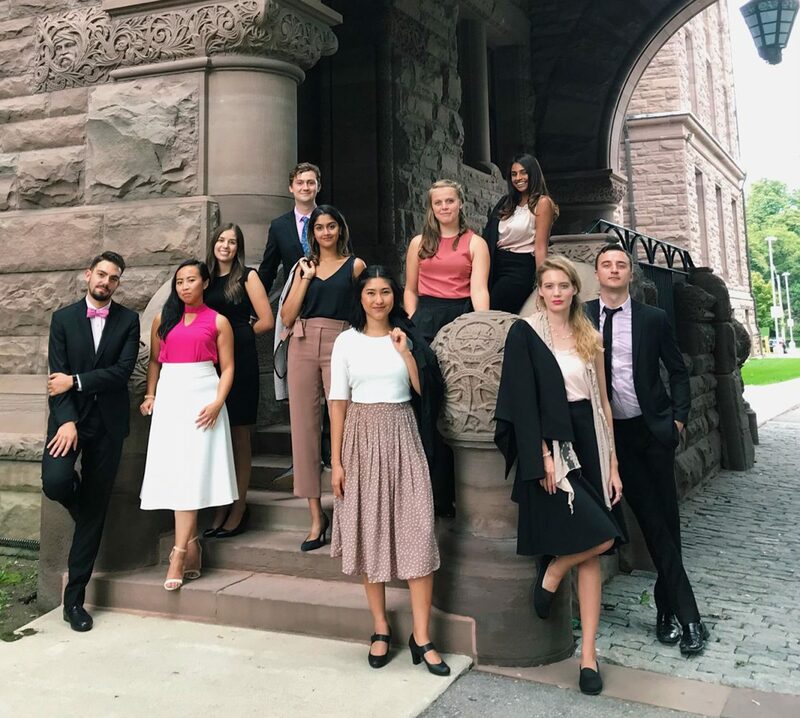 Applications for the 2019/2020 OLIP year will close at midnight tonight. We want to wish everyone applying good luck. We realize that this time of year is hectic and stressful, to say the least. It’s a time of uncertainty and waiting patiently for results from grad schools, internship, and job applications. We feel you! However, it’s also a time to reflect on all you’ve achieved thus far, and the possibilities for your life this upcoming year. As for us, we are currently finishing up our first placement — we have one week left until it’s over! We will then set out on our study tour to Yellowknife for a week before starting our next placement. Life is busy and still pretty stressful for us, but it’s definitely a different kind of stress. We’re still amazed and grateful to be able to participate in this program. Once again, good luck to everyone applying. We commend you on your hard work in all your endeavours thus far. Take a moment to breathe in this precious moment of life if you can!